It was that time again. It was spring camp time with all the games that going to camp over spring break brings. The crafts class all stopped working on their crafts class projects and listened to what Miss Sue had to say. Jay raised his hand and when Miss Sue called on him, he said, “How about a few games of crunch and toss”? Miss Sue thanked Jay and said, “Does anyone else have any suggestions”? Maria raised her hand and said, “How about a few games of TIC TAC TOE Waffles? You’ve got to eat them to win”! Just then the bell rang and crafts class was over. 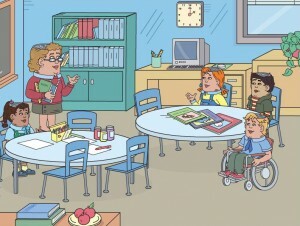 “Class, we are going to play Pick-Up Sticks”, said Miss Pat. Willie moaned and Hector groaned and Jay rolled his eyes. Miss Pat ignored them calling on Eulyn asking, “Do you know how Pick-Up Sticks is played”? Eulyn shook her head no. “Oh Orrie, You’re such a show off,” said Kathy, “You always know the answers”! Orrie gave her a look and said, “Can I help it if I’m smart and always look things up in Wikipedia”? “OK class, that’s enough”, said Miss Pat. Everyone settled down and Miss Pat invited Orrie to demonstrate how the game is played. She handed Orrie a bunch of sticks that she had in her hand. They were about 6 to 8 inches long. Then he took the sticks and dropped them in a pile on the table. He told his classmates that the object of the game is to remove a stick from the pile without moving any of the other sticks. The person that has the most sticks when all the sticks are gone is the winner. The “Can Do” Kids are studying common nouns. Miss Pat made a word jumble of common nouns just for fun. 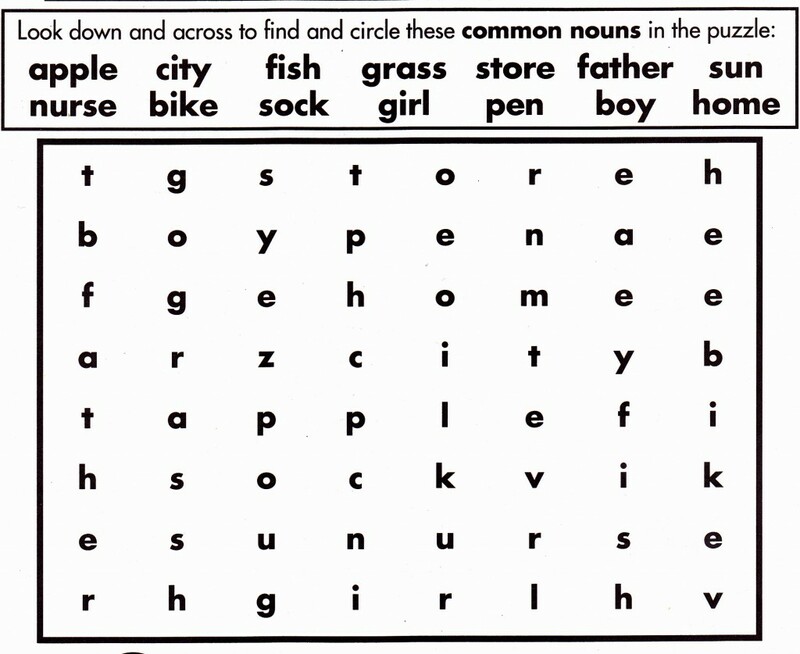 Why not print out the jumble and find the words listed below in the jumble? The “Can Do” Kids were helping their parents and grandparents decorate the party room at the community center for the Holiday party. Just then Miss Sue, the center director, came in and asked to talk to everyone. Parents, grandparents and “Can Dos” all sat down to listen to Miss Sue. “Good morning everyone,” said Miss Sue.” While I’m happy parents and grandparents are here, what I have to say is mostly for the “Can Do” Kids.” The “Can Dos” looked at each other, worried that they did something wrong but not able to remember what it could be. Miss Sue smiled. She knew what they were thinking. “You are not in trouble, children. I want to talk with you about what we can do for all the children who lost their toys and books during the hurricane that hit the next town from us. The “Can Dos” looked sad at just the thought of losing all one’s toys and books in a flood from a hurricane. Hector wasn’t so sure. He loved all his toys, even the ones he didn’t play with much. Kathy and Annie were having a hard time with the idea of parting with some of their old toys too. Orrie was the first to offer a toy and some books. Then Willie and Nellie agreed to go through their toys and books and find some that would make good nearly new play things. Pretty soon all the “Can Dos” agreed to give away a toy and a book to children who lost all their toys and books. Even Hector, Annie and Kathy said they would chip in a toy and a book. The “Can Dos” all nodded. The parents agreed to help them pack up what they were giving to the toy drive. The grandparents offered to help the “Can Dos”write notes to go with the toys and books they were giving away. Boys and girls reading this, here is a question for you…Do you have a toy or book that is in good condition that you could give to a nearly new toy drive near where you live?